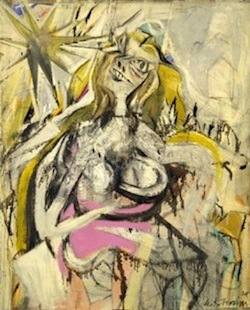 Dutch American abstract expressionist artist, Willem de Kooning, was boring in Rotterdam, Netherlands on April 24, 1904. He gained artistic training or experience at the Rotterdam Academy of Fine Arts and Techniques for 8 years. 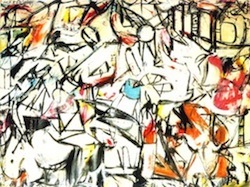 One of thirty-eight artists, De Kooning was chosen from invitation to New York City metropolitan artists to design and paint 105 public murals at the 1939 New York World’s Fair. 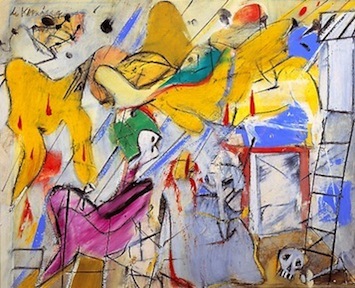 De Kooning was heavily influenced from Arshile Gorky, which led De Kooning to produce a series of male figures, such as Two Men Standing, Men and much more.